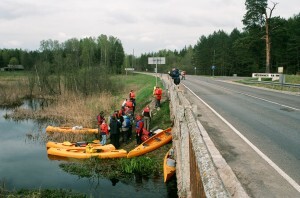 We begin the route in Kastīre village at the bridge-dike over the river Jāša (Jaša). Don’t mix with Preiļi-Krāslava motorway bridge over the river Jāša (Jaša)! For ca. 850 m the route leads along the river Jāša (Jaša) upstream that is not very appreciable. In summer this span usually is overgrown with water-plants that cause some inconvenience. After 850 m extension of river source begins and after another 500 m we arrive in the lake Jāšezers (Jašezers). Jāšezers (Jašezers) or the lake Jāšas (Jašas) is located in the Feimaņi hillock of the Highlands of Latgale, 149 m above sea level. Its area together with the island makes 97,8 ha. Length from north to south – 1,6km, maximum width – 0,8 km. 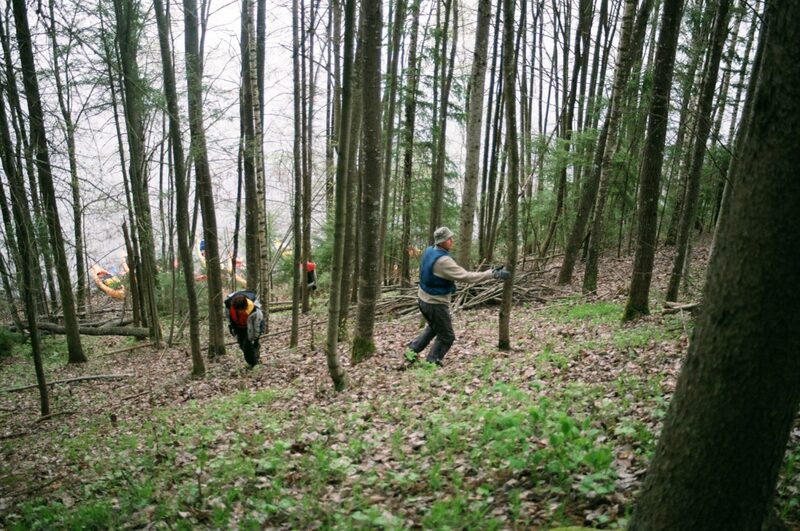 The average depth reaches 2,8 m. Maximum depth is established in south end of the lake and it reaches 4,1 m.
Further we move north-eastwards to the reck that connects the lake Jāšezers with the lake Bicāns. On the right side there is a peninsula with oakery that now is protectable landscape feature. In 2004 Jāšas-Bicāns lake nature restricted area was established where the mentioned peninsula and islands of the lake Bicāns were included. The total area of nature restricted area “The lake Jāšas and Bicāns” is 311 ha, ca. 82% of the total nature restricted area are occupied by both lakes. Ca. 15% of the nature restricted territory are covered by wood ca. 5% thereof are biologically valuable realms. Slightly-touched by people deciduous and broad-leaved trees wood biotopes with peculiar microclimate characterised by high humidity and other factors ensure the existence of rare, endangered and protectable lichen, moss and plant species. The usual tree lungwort found in the nature restricted area is a rare, air-humidity and light sensitive, high-value wood natural biotope indicator species both in Latvia and in Europe. After short 2,8 km we have left the reck and arrive in the lake Bicāns. The lake Bicāns is also located in the Feimaņi hillock of the Highlands of Latgale, 149 m above sea level. Its area is 159,0 ha, together with the islands – 164,2 ha. Length from north-east to south – 3,0 km, maximum width – 1,0 km. 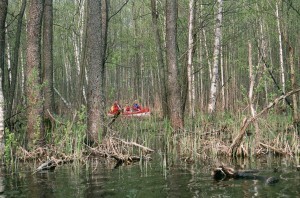 The average depth reaches 4,1 m. Maximum depth is established in south end of the lake about the middle between the first island that we see first when the entering the lake and the coast and reaches 18,8 m.
On the right bank of the lake Bicāns there is Geļenova park with tree species of rare occurrence. Structure of estate household buildings has also remained. Geļenova part is natural site that is under national defence from 1957. It is a scenic park with 23 species of exotic trees and shrubs, the area is 8 ha that includes dry-land and waters. The park was arranged in the peninsula of the lake Bicāns at the end of ninetieth of 19th century and at the beginning of 20th century, it belonged to estate manager who arranged the park in honour of his daughter Helēna. In former times the park was also so called –Helenova park. Estate building and adjacent buildings were in the territory of the park. The estate was imitation of the Renaissance style. In 1990 the remains of estate buildings were demolished, only the foundations have remained. 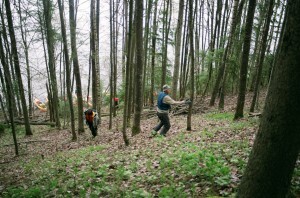 Local and induced species of tree plants have formed specific forest stand. In the south part of the park there is a plantation similar to wood park with big groups of larches and red oak-trees. Ca. 0,5km south-eastwards from the park there is an interesting larch stand. Such untypical for Latvia trees as Weymouth pine, European linden, Japanese larch, red oak-tree, white walnut, Caroline poplar, Tatarian maple and other interesting trees can be encountered in the park. In the fifth kilometre we reach the constriction –the so called Turčinks (in other materials Percovka) that in Soviet maps is marked as a separate lake but now it is regarded as a creek of the lake Bicāns. Having traversed the creek after 300 m we arrive at the culvert of the motorway Jaunaglona-Kategrade-Kastīre that connects the lake Bicāns with the lake Kategrades (Zvejnieku). Here is also the guest house “Šaures” where you can agree on night’s shelter if necessary. The area of the lake Kategrades reaches 134,4 ha. The length from north to south – 2,7 km, maximum width 0,7 km. 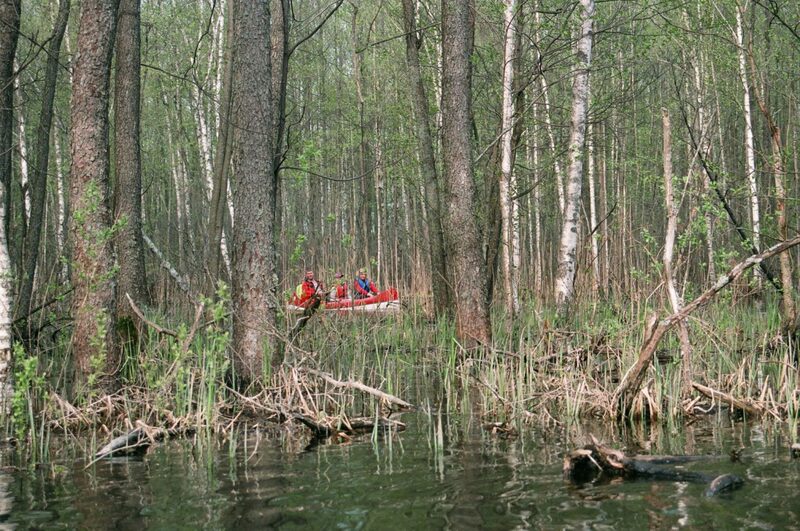 The average depth of the lake is 1,6 m, in the deepest place it reaches 3 m. In summers the lake becomes very overgrown. Because the lake is not deep and is overgrown it is reach with fish. Under favourable conditions you can get here good catch of pikes. At the north end of the lake Kategrades there is Kategrades castle mound. The castle mound is strongly overgrown with wood and has no explicit descents. The hill is 17 m higher than the ambient meadows. A story goes that this hill was brought by French soldiers during the war. This story, of course, has nothing common with the real origination of the hill. Till Šaures we have managed 5,3 km. In the lake Kategrades we move southward, south-eastward. The south end of the lake in summers is usually strongly overgrown in the result of what floating islands are formed that in windy weather makes jams at definite places. Now the situation is so that the floating islands have filled the creek of the lake at railroad culvert. Therewith the boats must be either carried over the railroad or carried to the culvert and then pulled through the culvert to the lake Zolva. To the railroad we have managed 7,6 km. Also the west end of the lake Zolva at the railroad in summer usually overgrows, but the more we move eastward the rarer the overgrowth is. 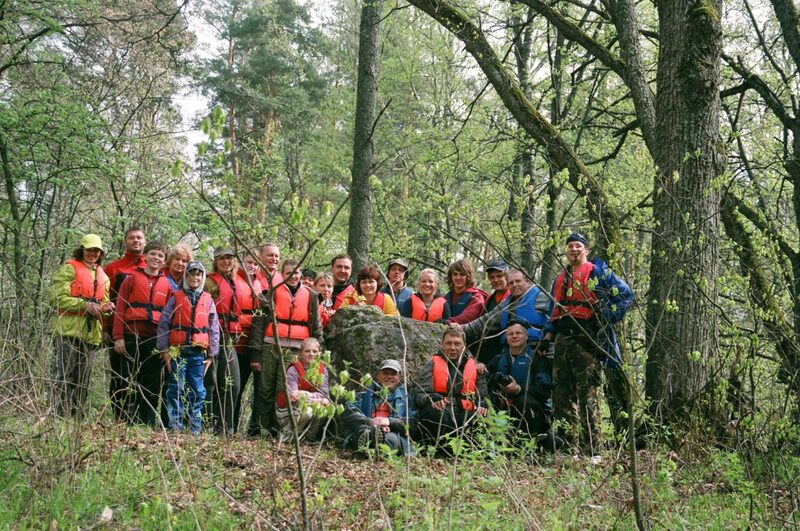 The lake Zolva is also geographically located in the Feimaņi hillock of the Highlands of Latgale. If the aforementioned lakes were 149 m above sea level, then the lake Zolva is 149,6 m high above sea level. The area of the lake without islands is 351,2 ha, with islands – 359,2 ha. Length from north-east to south-east reaches 5,5 km, maximum width – 1,6 km. The average depth is 2,8 m, but the maximum depth exceeds 6,5 m. The deepest places are located at the west and north-west bank of the lake. 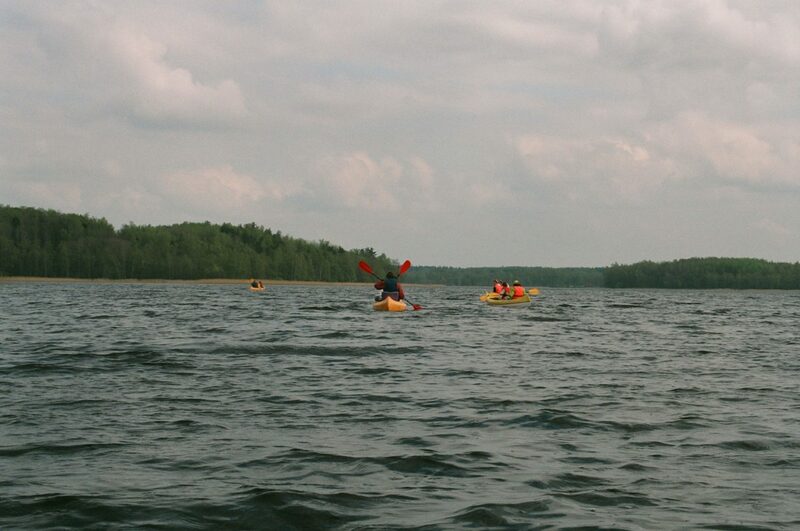 After 9,2 km we arrive in the wide waters of the lake Zolva. Here on the right banks you can see leisure complex “Zolvas”. Here is a guest house, sauna, campsite houses and sports grounds. In the further route we reach the peninsula that already during Soviet times was covered with buildings as the gardening society “Zolva”. Further we can se a light blue building that is a private rest-house. Stay here is possible only with permission of the owner. On the north of the lake Zolva there is the Krupeniški castle mount, but in the north-east part Krupeniški old-believers village where only a few houses are populated. Here is a cemetery and old-believers’ preaching house that is in a bad condition! Larch stand that is not typical for Latgale is the most interesting landscape feature here. At this end of the lake if necessary it is possible to find an acceptable campground. Behind the bridge the route continues along the nullah Rušonīca. In spring this span doesn’t cause any difficulties but in summer the nullah usually strongly overgrows, floating islands begin to travel and beaver activities don’t stay without consequences also, and of course the nullah overgrows with water-plants. That is why you have to take into consideration that you’ll have to pull the boat for some span. When slushing through slime some leech chance to appear! The impassable span isn’t usually longer than 500 m.
Sooner or later everything comes to an end! We have reached the small lake Seksts (area 16,0 ha without the island, with island 16,1 ha). 14,7 km are covered! When the nullah Rušonīcas discharges into the lake Seksti, ob the right side on the bank of the lake we can see steps. Here the boatmen can land and go onto the castle hill of Rušonīca (Rušenīca). Quite recently here were archaeological excavations, and VAS „Latvijas valsts meži” has put in order the castle mound and its surroundings – they have cut down the spare overgrowing, installed the steps and built a shed. It is worth to walk on the impressive bank that stretches northwards in parallel with the nullah Rušonīca. In the place where the bank ends steps are installed and you can get back to the castle mound by going along a wood road. The first person who explored and measured the Rušonīca (Rušenīca) castle mound was Ernests Brastiņš on 29 and 30 July 1925. In 1928 the author published his description and measurements in the paper „Latvijas pilskalni: Latgale”. Having traversed the small lake Seksti at the south-west end we arrive in the river connecting the lakes Seksti and Rušons. We have covered 16 km and arrived in the lake Rušons. Area of the lake Rušons is 2373,0 ha, together with islands 2407,0 ha. 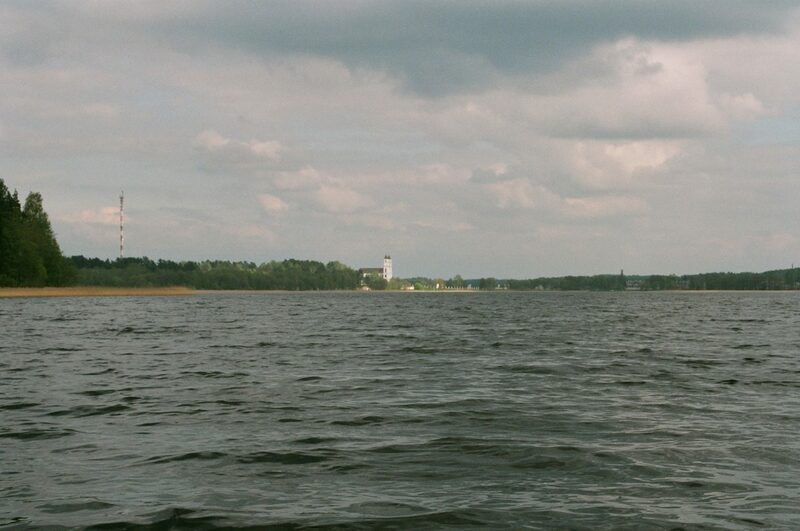 It is the eighth biggest lake in Latvia. Maximum length reaches 13 km, but width – 5,5 km. 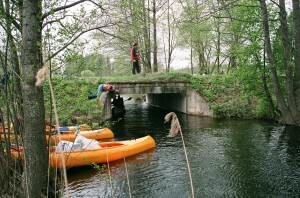 The average depth is 2,9 m, but the maximum depth reaches 29,9 m and this place is located at the end of the creek Ūbeļu. The lake has complicated configuration and long coastline. The west part makes broader aquatorium, there are 10 conservation islands. In all there are 34 islands in the Rušons. Eastward the Rušons gets narrower and gets to the meandering creek Ūbeļu where there are many scenic creeks and islands. From the main part of Rušons it is separated by a big wooded peninsula so this long creek sometimes is called also the lake Ūbeļu. In this creek the tourists can spend several romantic hours. When returning to our route – in front we see two islands, the smallest island has no name, but the biggest island is Ozolu island. Behind them you can notice Bērzu island that is famous for impressive colony of gannets (sea ravens). There are circa 30 occupied nests at the south end of the island. Here it is possible to establish a camp but it must be done at the north end of the island. However you have to take into consideration that there birds are not quiet and with dawn begin to rustle actively. From the Bērzu island you can see clearly Lielā (Upursala) island and the proximal Priežu island. It will be more convenient to establish the shelter for the night on the Lielā (Upursalas) island. On this island you must definitely see Rušona Upurakmens [sacrifice stone]. 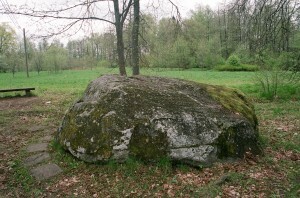 On the central part of Lielā (Upursala) island there is hill front on the highest part of what there is a stone that is still called the sacrifice stone. A story goes that once there have been writings carved on the stone and lambs were taken there for sacrifice. Nowadays no carvings can be seen on the stone. The Upurakmens is 1,2 m high, its circuit at the ground is 5,5 m. The stone is coarse-grained, its surface is crumbled. It seems that it had been artificially smoothened. Earlier a fire was burnt at the very stone and on it. Crumblings, splinters torn of it found around the Upurakmens testify thereof. Archaeological excavations were made at the Upurakmens. No antiquities were found in excavation by that the usage period of the island Lielā (Upursalas) could be determined. So far it can only be assumed that the sacrifice stone as a place for worshipping could have been used by the inhabitants of settlements Kristapiņi, Liepu salas and Mazie Mucenieki, and of Kurtošs castle mound, and also of other nearby ancient settlements. When planning shelter for the night you have to take into consideration you speed of movement. You have to consider that when traversing the lake Zolva and entering the nullah Rušonīca it shall be troublesome to arrange a camp. So the camp places should be planned either on east end of the lake Zolva or on the islands or ashore when entering Rušons. If you have decided to arrange the camp on any of the islands of Rušons, then you should be careful towards the nature because these islands are nature protection objects. Don’t leave garbage here, but try to take it ashore! For real water tourists it goes without saying and it must not be reminded once more! It is differently with some local visitor of islands! On the next day we move along the shore of the island Priežu and behind it we turn southwards to Jaunaglona. The white church of Rušona is left behind on the west coast. When moving to Jaunaglona the tower is a good reference-point that can be well seen. We enter Jaunaglona creek and by channel we go to the dike. We have managed 22 km. Here we’ll have to carry the boats. They can be carried to the next street and only then released in water because the culvert under this street is narrow and during high water level difficult to pass. In summer it is passable. Over the dike where we have stopped goes a street. 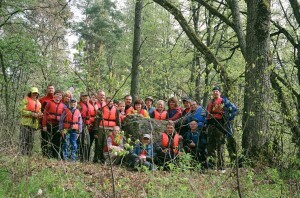 When going along the street westwards after 100 m we arrive at Kameņeca Great stone. This inscription indicates that on the stone or near it there has been a catholic chapel – preaching house. Stories written down in the beginning of our century testify that really there has been a church on the stone where several tens of people could go in. Perhaps the chapel wasn’t built exactly on the stone and it was inside the chapel. In other stories it is said that the lightning has split the stone in two parts and the chapel crashed. However, the Kameņeca Great stone has also the characteristics of cult stone – a regular cylindrical cavity is carved in the highest place of it (diameter 30 cm, depth 30 cm). It is supposed that originally the stone really had been a component of pagan sanctuary. By introducing the Christianity that became active in Latgale in the 17th century due to Jesuit activities a chapel was established in the place of the old sanctuary. After 500 m we reach Jaunaglona-Rēzekne/Daugavpils motorway bridge behind that we go into a small lake with the name Katleņš (Katliņš). When we have covered 23,2 km, we enter the lake Skudrinka (area 9,4 ha). 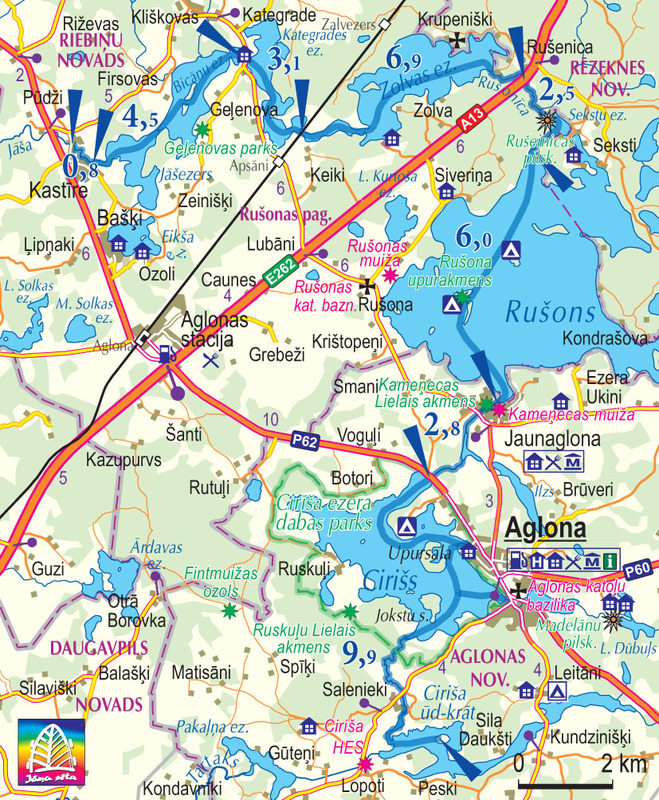 North part of the lake is continued by Tartaks where we continue the route to Aglona – Preiļi motorway bridge. This span is easy passable both in summer and spring and doesn’t cause any difficulties. When arriving at the abovementioned bridge we have covered 24,8 km from the beginning of the route. Here is also the entry of Tartaks into the lake Cirišs. The lake Cirišs is the second biggest lake in our route. Its area without the island is 629,3 ha, but with the islands 663.34 ha. 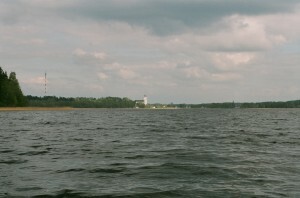 Upursala (18,24 ha) and Joksti (Ošu) island – 15,80 ha, two biggest islands of the district Preiļi are located in the lake Cirišs. Length of the lake from north-west to south-east is 5 km, but width 2,5 km, the average depth 5 m, but the maximum depth 10,5 m. The lake Cirišs and the lake Ruskuļi and surroundings in area of 1297 ha are included in the country park “Cirīšu ezers”. Islands of the lake Cirišs are included in the restricted area of the park and the provisions of nature protection state that in the restricted area it is forbidden to arrange tourist halts where the tourists stay for more than three days and nights. So water tourists can surely stay one night on any of the islands. Along the Jaunmuiža creek we bypass the peninsula Jaunmuiža (Ksaverina) at the end of that there is a campsite and we go to the island Upursala. In Upursala VAS “Latvijas valsts meži” has arranged a footpath that is worth walking and getting acquainted. Going along the footpath we can arrive at the hill Upurkalns of the island Upursala. Previously it was regarded that the hill Upurkalns of the island Upursala is a cult place not modified by people. In 1977 the archaeologist J.Urtāns surveyed Upursala and archaeological excavations were made in Upurkalns and at its foot under his supervision. It was found out that Upurkalns has features characteristic to a castle mound. Although the hill and island have significant name, archaeological excavations didn’t reveal nothing that could be surly connected with the traditions of ancient cult. According to the found antiquities the usage of the hill Upurkalns of the island Upursala is to be dated with I millenary B.C- the beginning of I millenary A.C., but the settlement at the foot of the hill had formed around the middle of I millenary. From Aglona to the island Upursala you can get by a motorized floater by notifying it in advance. With the boats you can stop at the east of the island or at the side of Aglona, at the same place where the floater lands. The boats can be conveniently left by the established plank-way. Here you can arrange also a good halt, but you have to take into consideration that for a big group it will be a bit for small! To the island Upursala we have managed 28,4 km. With visiting the island Upursala we could end the two-days long route and go over the reck to the bathing ground of Aglona where it is easy to land and drive up with transport. If you want to fully enjoy the beautiful landscape that greets from the lake Cirišs to the basilica of Aglona, then it is advisable to continue the route along the lake and end the tour at the south-east end of the lake not far from the parking-place of basilica of Aglona. In this case the total managed length of route shall be ca. 30 km. If it is planned to continue the route, then bypassing the island Upursala we go further in the direction of the island Joksti (Ošu). Behind the island Joksti (Ošu) in a creek on the left there is fitted place for tents that is located on private owner’s land and staying overnight must be agreed with the owner. Tartaks or the nullah Salinieki sluices in the creek on the right by that you can get in Ciriša HPP reservoir. Source of Tartaks from the lake Cirišs is 30,5 km from the beginning of the route. Covering ca. 2 km along the Tartaks we have reached the Aglona-Višķi motorway bridge and after another 0,7 km we reach the entry of the nullah in Ciriši HPP reservoir creek. Ciriši HPP reservoir is one of the biggest dammed lakes of artificial origin in Latgale. 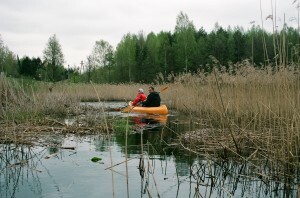 This dammed lake is the sixth biggest among lakes of natural origin in the former district Preiļi. Ciriša HPP reservoir was created in 1960 by building a hydroelectric power station on Tartaks and by raising water level for 10-12 m. Depending of work of dikes the area of reservoir can vary from 210-260 ha. Before formation of the reservoir here were a chain of small lakes that were mutually connected by the river Cirišs. These lakes had settled in the subglacial furrow so the maximum depths were big and reached even 34,5 m. In the chain of these lakes there were lakes Dziļūksna, Jagodki, Pirtspakurs, Tūļeišs, Raudiņi and the mill lake Sekļi. Length of the reservoir is 7,3 km, width reaches 2,6 km. We continue the way along the creek till we arrive in the big reservoir. Here we turn eastwards and go to the second island where is our next shelter for the night. We have managed 34,7 km. Depending on speed of movement the described span can be managed in two days. 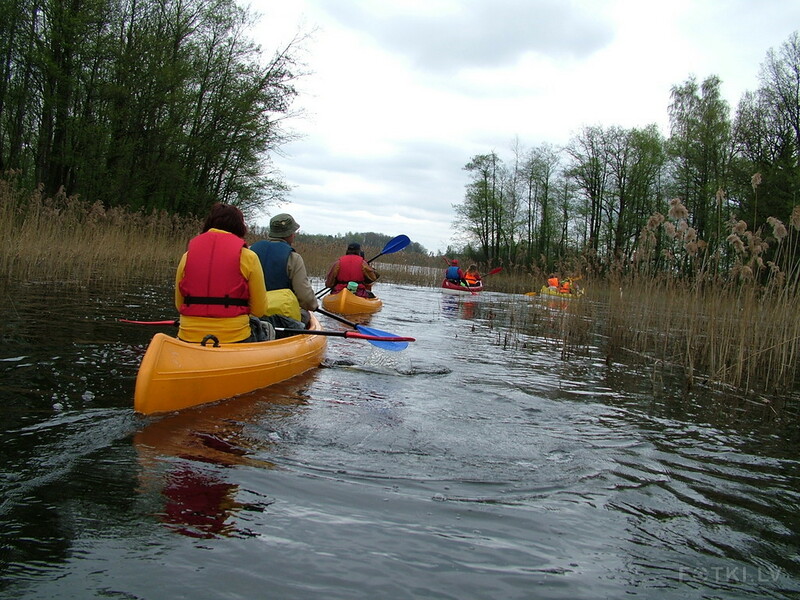 The fastest water tourists have got also to the lake Pakalns (Pakaļņu) and have arranged the halt on the banks of this lake. With further description of the route you can get acquainted in description “Along Tartaks” and continue the route.